Are Syriza progressive reformers or cynical populists? Syriza's approach to both European and domestic issues has shown the party more interested in power and self-preservation than in reform. Flickr/Georgios S. All rights reserved. When we look at populist and eurosceptic movements in Europe we normally focus on their striking ideology. Populists of the Right are seen as ideologues of nationalism. Populists of the Left, as ideologues of class war. Their common thread is their deployment of a collective ‘we’ as the subject of political and social life. The populists speak from the first person plural. They normally express their anger at injustice committed to ‘us’ by ‘them’. They thus reject some established political order or settlement. The populist’s basic moral categories are sound. They are primary concepts such as just and unjust, legitimate and illegitimate, powerful and powerless. The populists’ error lies in the facts. The collective personification on which populism is based is always artificial. There is no fact of 'we', nor a fact of 'them'. The actions and the intentions imagined have never existed. It does not matter. The aim here is psychological, not analytical. Populist rhetoric allows for a neat distinction between victims and perpetrators. ‘We’ are the victims, and ‘they’ are the perpetrators. If you think yourself a victim of some social and political injustice, you will love to hear you are not alone in your misfortune. It is also nice to be able to have your anger focused on someone or something concrete. Responsible leaders and journalists rarely match the demagogue for clarity. This brings us to an important aspect of populism, which we must never lose sight of. It is its leaders’ strong desire for power. By looking at populism as an ideological reaction against power, we forget that its primary purpose is power. In his notes on nationalism, George Orwell writes that ‘nationalism is power-hunger tempered by self-deception’. He was making exactly the point that the purpose of populism is the use of emotion and high ideals in order to win the offices of state. This explains why when populist movements reach power their most ferocious fights are those taking place internally. The leaders of a populist movement may well be animated by anger, yet one cannot lead with anger. As its main symbol, the leader of the populist movement must remain in full control of his or her person and of the intended message. Leading the party takes self-control and discipline. Populist leaders, like all political leaders, are skilled performers: they show emotion while hiding their thoughts. 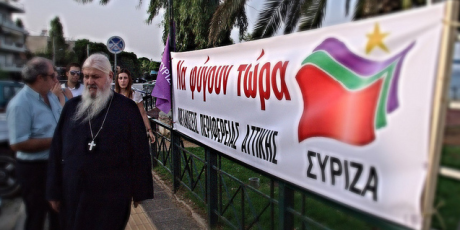 Syriza: a case of cynical populism? This is why even today Alexis Tsipras remains something of a mystery. What does he believe in? What do they want? How much of his followers' anger does he share? How centrist will he become, once in power? We are not sure. In the case of Tsipras, who has been Prime Minister since January, we do not even know if he wants to stay in the Eurozone after more than four months of talks. We do not know if he loves the EU or if he despises it. He is capable of saying both things in a single speech. His indignation is the only thing that has remained constant. But if Tsipras' position on the Euro is highly ambivalent, his actions on domestic politics speak volumes. His government's priority has been to appoint scores of party cadres to all kinds of positions: from state controlled banks, utilities, hospitals, the national radio and television channels and the secret service, Syriza’s partisan appointments now run the state in its entirety. He has also worked to satisfy the two groups of special interests that propelled him to power: civil servants and professional associations. Civil servants have been promised no more layoffs as well as the re-hiring of those laid off by the previous governments. Teachers are spared professional assessment and can now elect the head of their school in a secret ballot. Civil servants’ pension rights, which entail that they retire several years before those working in the private sector, are a ‘red line’ for the government in its negotiation with the EU and the IMF, who warn that the pensions system is unsustainable. The main Greek professional associations (i.e. doctors, pharmacists, engineers and lawyers) have not been pro EU and pro-Euro through the crisis. They have been at the forefront of anti-EU sentiment and anti-'memorandum' campaigning. Their main aim is to block any opening up of the services market. These groups have enjoyed important privileges over the years. Regulations prevent economies of scale that would have brought prices down, for the benefit of the consumer. All professionals enjoy preferential treatment as to their pensions’ contributions and benefits. They are normally never subject to external investigations over their professional conduct, because the regulator and the trade union are normally the same body (this is why, for example, investigations for malpractice or corruption are extremely rare). In addition, there is compelling evidence from academic studies that the self-employed professionals are the worst tax evaders. In spite of their status at the top of Greece’s social and economic hierarchy, these associations have all been anti-reform and anti-‘memorandum’. They have all been rewarded by Syriza in various ways. Lawyers have won the withdrawal of plans to simplify trial procedure and shorten lengthy procedural requirements in civil cases (which make civil justice in Greece one of the slowest in Europe). Public works contractors have also done well. An existing road building project will be divided up into lots, irrespective of considerations of best value, scale or quality, so as to explicitly enable smaller engineering firms to bid for them (instead of one of larger firms, who are generally more competitive). This measure was announced by the minister of public works, who was until recently the head of the engineers’ association. Most striking of all, reversing previous policy, doctors have now been allowed to prescribe generic drugs by trade name. This may seem an inexplicable decision because generic drugs are all the same. Still, the doctor’s union were asking for it and finally won it. The only rationale is that the decision creates an incentive for Greek generics manufacturers to approach doctors for favourable treatment. This measure is an invitation for more corruption. The government is also resisting – alongside the pharmacists’ association – the sale of over the counter drugs, i.e. those not requiring prescription, at super markets (as practiced in most European countries). In all these cases Syriza's government has sided with powerful special interests, at the expense of the consumer and the tax payer. Syriza legislates in order to distribute resources and opportunities from the poor to the well off and the well connected. Finally, Syriza has chosen not to pursue the ‘minimum guaranteed income’ which had been planned by the previous government as an obligation under the ‘memorandum’ of 2012. Greece is the only country in the EU which does not support its poorest by way of a general and universal benefit in cash. This gap was intended to be filled by the new ‘minimum guaranteed income’ which would have been centrally administered and monitored. The government rejected this plan because, as it said, it would have created a ‘welfare trap’. This is exactly the argument used by Ronald Reagan and Milton Friedman against the welfare state. The real reason, presumably, is that the measure is something proposed by the EU. Syriza’s anti-Europeanism is more important to its self-image than its commitment to social justice. All these policy choices show that Syriza is not interested in social reform or in economic growth and success. Its main concern in the first four months of its tenure has been to strengthen its nationalist credentials, to paint the EU as an ‘enemy’ and to build a new clientelistic state. We should not be surprised. Nationalist populism is a movement seeking power. It does so without concern for analysis or substantive policy proposals. George Orwell would not have been surprised. The article is based on a comments on populism and euroscepticism given at a seminar at the Egmont Institute in Brussels on June 1.